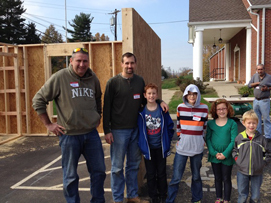 Cincinnati office staff and several family members gathered to help build walls for CrossRoads Missions and Cincinnati Habitat for Humanity. CrossRoads Mission is a recent recipient of $3,500 in funds from the Terracon Foundation. Despite the heat, team Terracon had fun working together to build four wall sections. Overall, wall sections for two houses were built in less than 4 hours! CrossRoads Missions serves as a doorway for community and church groups to serve others in meaningful enduring ways that provide life change for those serving and those served. Habitat for Humanity is an international organization with more than 1,400 local affiliates in the United States and more than 70 national organizations around the world. With volunteer support, Habitat has helped more than 1 million families — representing 5 million people — improve their living conditions since its founding in 1976.